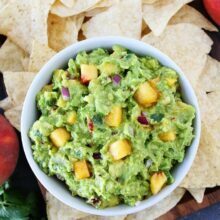 It’s Friday and we are celebrating with Mango Guacamole AND a giveaway for Gaby’s new book, Absolutely Avocados. Gaby is one of my best blogging buds. I think we are long lost sisters. We are both planners-like the annoying type of planners who always have to know what is going on WAY in advance. We are also both head over heels in love with Tim Riggins. It’s usually not a good idea for friends to have the same crush, but I am happy to share Riggins with Gaby. We both have Tim Riggins shirts and wear them with pride. Texas forever! 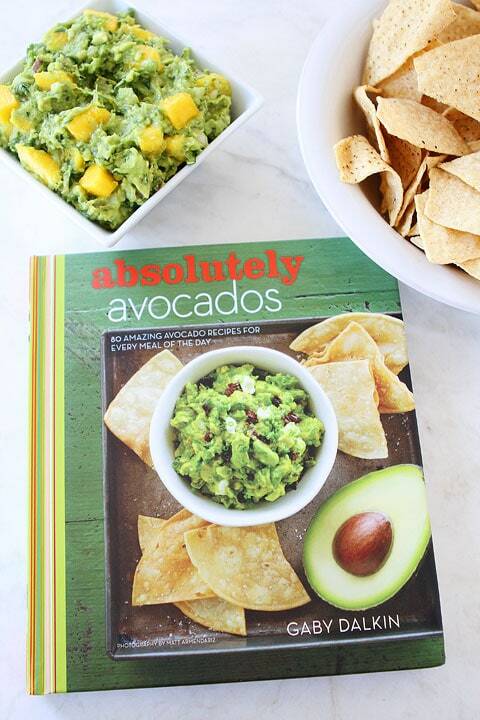 Absolutely Avocados is filled with 80 avocado recipes. I am absolutely loving it! I am thrilled to say my friend wrote this book because it is genius! Everyone needs this book and everyone needs to try this Mango & Cilantro Guacamole because holy guacamole is it good! I have already bookmarked about every recipe in Absolutely Avocados. I want to make them all! Since I can’t make decisions and didn’t know which recipe to start with, I asked the one and only Gaby for suggestions. She agreed it was a tough choice, but helped me narrow it down to Mango & Cilantro Guacamole. 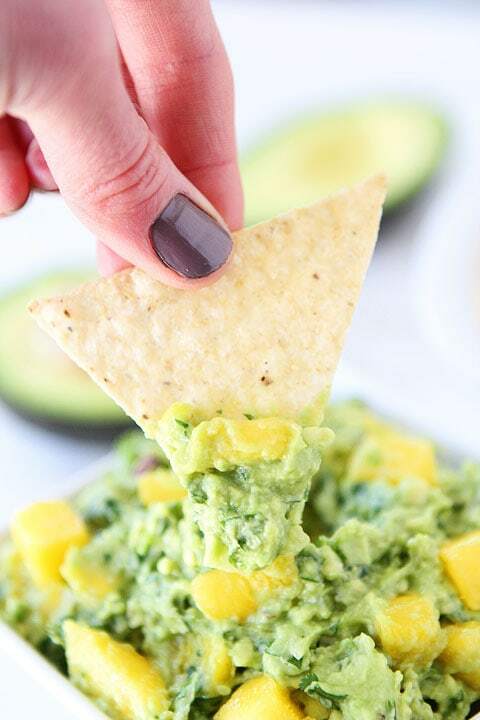 You can never go wrong with guacamole! 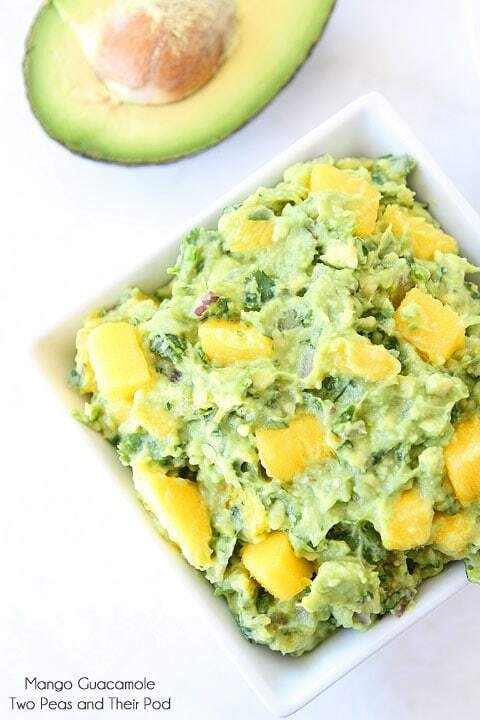 Mango & Cilantro Guacamole only takes 10 minutes to make and probably 2 minutes to eat. I couldn’t even finish taking the pictures before getting my dip on. I HAD to have a taste! I love the chunks of juicy mango! This simple guacamole is perfect for spring, summer, and Cinco de Mayo. It goes well with fish, grilled chicken, enchiladas, tostadas, or any Mexican meal. And you can’t go wrong with just opening a bag of chips and devouring the whole bowl. That is what I did:) Perfection! 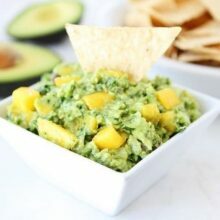 The mango brightens up the guacamole and adds a hint of sweetness! 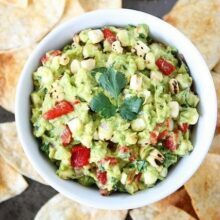 This easy guacamole is perfect for any party! Add the mango, cilantro, red onion, chile, lime juice, salt, and pepper to the bowl. Mash with a fork until half smooth and half chunky. Taste and add more salt and pepper if desired. Serve immediately with tortilla chips. Disclosure-Houghton Mifflin Harcourt is providing the book for this giveaway, our opinions are our own. This post contains affiliate links. I love guacamole with mangos in it, so good!! What a great cookbook your giving away! That looks delish! Can’t wait to try it! Yum, this guacamole looks delicious! Love that it has mango and cilantro! This recipe looks amazing! How nice for the summer outdoor BBQ’s! Another great recipe from Gaby’s new book! Man she is killing me!! This look and sounds incredible! I can not wait to make it! Nice dip for spring and summer. I loooove mangoes, and I love avocado, but I never thought of the two of the together before! Amazing! Another amazing recipe! Can’t wait to try and dig in! 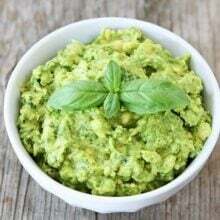 I absolutely love guacamole and this looks so good. Avocados are my all time favorite food!! Avocados and mangos are one of my favorite flavor combos! Looks delicious! I love mango salsa, I love guacamole. This looks AMAZING! It looks so yummy! We love avocado’s and mango’s. I love LOVE mangos and avocados!!!! The one thing I cannot eat is cilantra. It makes me deathly ill. So it is hard to eat out sometimes because they have already added it. One thing with homemade it is up to ME!! This is a great recipe!! Wonderful dip and a delish giveaway! Thanks for sharing! 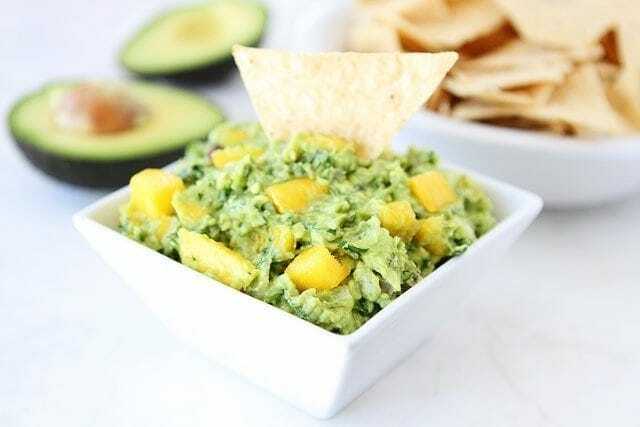 I started making mango guacamole for my clients a little while back and they love it! Sometimes I add pomegranates to this too, I love the added color and sweetness from adding fruit to guacamole. Gorgeous photos!!! I have to pick just one way to enjoy avocado? Hmm. I like it in my chocolate smoothies, I like it in guacamole, I like it on EVERY salad, and I don’t mind mixing them with goat cheese for a tasty sandwich spread! Yum! 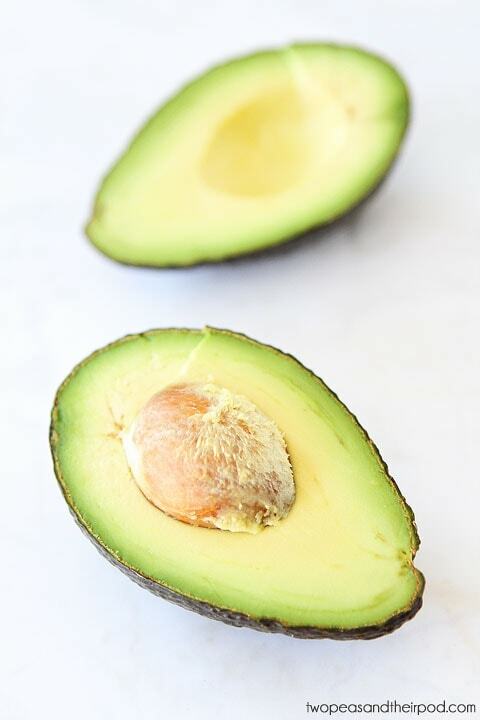 i love your avocado grilled cheese recipe, avocado is great plain, on toast or bread, or as guacomole!! Avocados and mangoes were meant for each other! I could LIVE on avocados! My favorite food. Favorite is guacamole, I put it on everything. 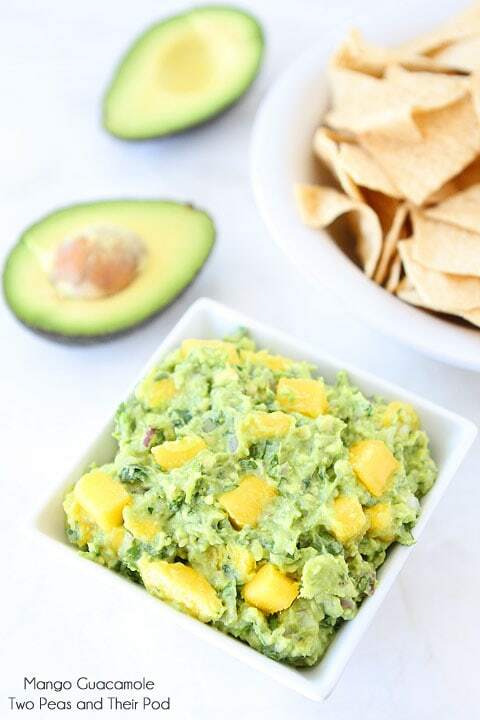 I actually don’t think I’ve ever thought to pair mango and guac together before but what a great idea! Perfect cinco de mayo food! Looks absolutely delish! Can’t wait to try it! Avocado and mango are such a great combination!! Avacado is one of the first foods I fed my grandson as he began solids. I wish we could grow them in Michigan. Mango with avocado! I’ve never tried it, but it sounds refreshing! I love making a Avocado Dip with jalapeno’s. Oh my gosh…STUNNING photos and SO delicious sounding! 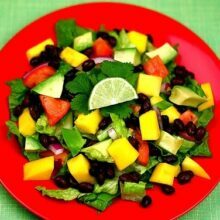 I love avocados and mangos, so this is the perfect recipe for me! I frequently make a mango avocado salsa for fish (usually salmon). I think I might just have to get this cookbook! You should make avocado cookies to keep you both happy. Cool! I love your contests!! Keep em’ coming!!! I recently featured this recipe and your blog in a blog post! Check it out!